The screening of Award winner short movies of the 3rd NEW KENBITEN Annual Competition of Art in Hiroshima Prefecture has held. After the screening, we had talk show with Director Mei Masuda, Director Yuki Shinohara and MC Hiroyuki Watanabe. 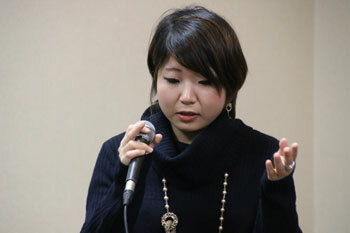 Mei Yasuda is the director of the animation “UTSUTSU” which received prize for award of excellent. Yuki Shinohara is the director of the live –action film “OWARANAI YORU NI” (Never Ending Night) which received the prize for incentive award. After Watanabe introduced what is the 3rd NEW KENBITEN Annual Competition of Art in Hiroshima Prefecture, both Masuda and Shinohara went to the stage. While they walked to the stage, Shinohara gently guided Masuda to the stage. The talk show was started in a warm and gentle atmosphere. Watanabe asked both of directors the feeling when they received the prize. Masuda answered, “This award was my very first prize in my life, I still cannot believe it.” She was still in “UTSUSTU”, half dream and half real. Shinohara said, “I went to the award place to watch all films, and once I watched “UTSUUTSU,” I found out “UTSUSU” got the award of excellent.” On the other hand, when he talked about his film, he was very modesty and he said, “I was very fortunate to get the incentive award.” Masuda was very impressed by expression of live-action film because it is very different from expression of animation. 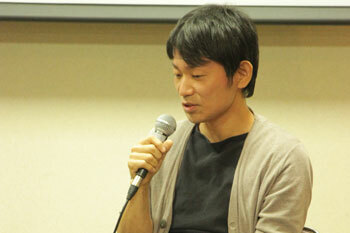 Watanabe admired and said each of the creators were influential in this competition. Then they talked about what was the motivator for making this film. Masuda said, “I made this film for my graduation art. I designed to make film that contains everything I love, but I could not get all my images into one film. I just started to make the film one month before the due date. I decided to make this film by hand painting, but I needed tons of pages to express softness. It was the hardest thing. Shinohara said, “it was very limiting to make film because I would like to mix playing with my child.” He went to film very early morning before his child woke, then he edited during the time his child took nap.